HyComb International has been in operation for over 25 years, with offices in America, United Kingdom, China and Australia. HyComb Australia was established in 2016 in an effort to ease access between Australian customers and our international offices. Our parent company has been providing innovative building solutions for over 25 years internationally. Specialising in non-combustible aluminium honeycomb panels and more. Establishing an Australian office was the next natural progression allowing customers seamless access and delivery of our product range. We can now offer local sales support, quality control, best price in dealing direct with the manufacturer and most importantly peace of mind. Our product range includes an extensive range building material including stone slabs such as granite, marble, onyx, sandstone and bluestone; joinery; HyLight (stretch led ceiling); HyQuartz engineered stone slabs; Joinery by HyComb and HyComb panels (aluminium honeycomb panels) - the game changer in non-combustible cladding for internal and external building applications. HYCOMB Australia offers a local solution in Oz allowing our customers to deal direct with us, the manufacturer, which heavily reduces the costs for your commercial and residential projects, while providing a professional and seamless experience. Our team of professionals have in depth international and domestic construction experience and recently contributed to several multi-billion US Dollar casino and resort projects in Macau. We will manage the process from order to delivery (and installation if required) - meeting our clients’ full expectations by giving you peace of mind in regards to quality assurance and on time delivery. We also eliminate the concerns when dealing with international manufacturers including language barriers, logistics and customs clearance. 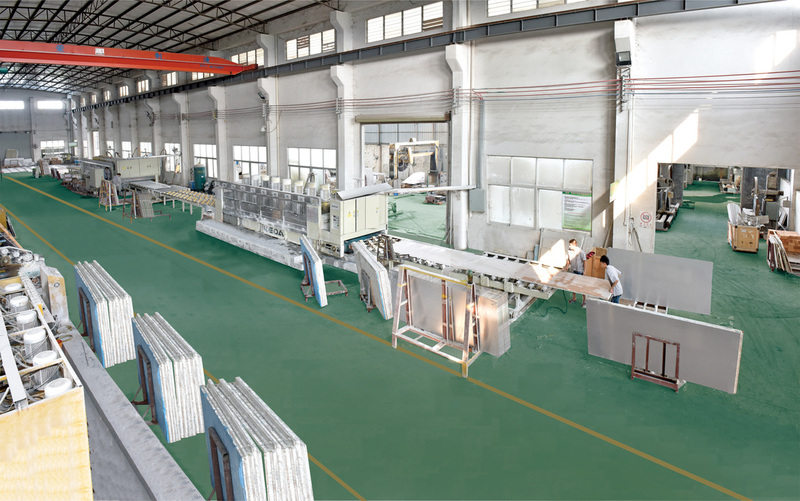 Our factory produces non-combustible aluminium honeycomb panels with various finishes, which are AS/ASTM/BS/PSB test approved. Our production capacity of stone honeycomb panel is currently 3 million m² per year. Our panels HyCOMB brand has been used in many international landmark projects the including the Australia, USA, Spain, Russia, Singapore, Hong Kong, Korea and Japan. Our product range extends to HyQuartz - reconstituted stone slabs and benchtops. HyLight - stretch ceiling lighting system. Joinery by HyComb - joinery solutions manufactured in large volume if required. Natural Stone - access to 10,000 stone types through our large sourcing network. Sam Lo joined the construction industry in 1974 and holds a Bachelor Degree of Civil Engineering (UTS). He is a Chartered Professional Engineer of the Institution of Engineers, Australia and Hong Kong. He has been working in both the Building Construction and Civil Engineering fields in Australia, New Zealand, Hong Kong, Macau and Mainland China for some of the world's most renowned tier one contractors and local governments including Leighton Contractors, John Holland, Westfield Group and Penrith City Council. Most recently, he has completed his role as project manager for the US$2.5 Billion Wynn Palace Casino & Resort project in Macau, where he was responsible for the whole reinforced concrete structure and the post structure interior fit outs. Having spent over 40 years in the construction industry, Sam has acquired a wealth of experience and contacts. Upon completion of his last Casino project, Sam was appointed Director for Hycomb Australia. Sammy Lo, joined HyComb in 2016. He graduated with a Bachelor of Media from Macquarie University in 2002. He has over 15 years working experience in the fields of sales, advertising, marketing, public relations, logistics, account management operations and event management. He has worked with some of the world's largest multinational companies driving their message forward in below the line marketing strategies, former clients include Salesforce, Symantec, Samsung and Apple. Most recently he has joined HyComb elevating the status quo within the construction industry when dealing with suppliers and installers. Offering exceptional after sales support, logistics management and project management. He has a strong background in building long-term relationships and partnerships, ensuring mutual growth and benefits over the long term.